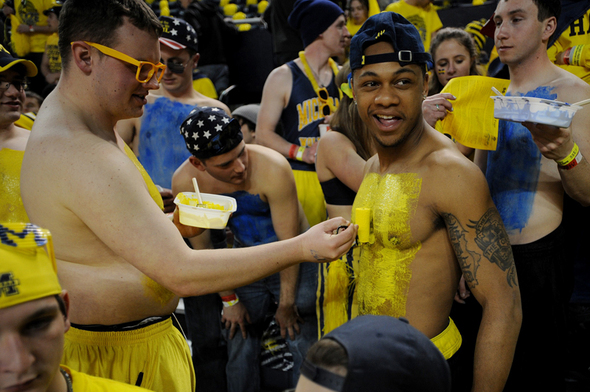 Posted on Sat, Feb 18, 2012 : 7:12 p.m.
Roy Roundtree, a wide receiver on the Michigan football team, smiles as he has his chest painted by U-M junior Mike Szymusiak of Dexter before the Wolverines' game against Ohio State at the Crisler Center on Saturday night. The Crisler Center will be full. ESPN is in the house. Rival Ohio State is the opponent. Big Ten title hopes are on the line. Yeah, this is a pretty big game for the Michigan basketball program. AnnArbor.com sports reporter Nick Baumgardner will provide live updates via his Twitter account. Find them scrolling below. Sun, Feb 19, 2012 : 4:10 a.m. Woo hoo! The Wolverines won 56-53! 20-7 overall. Sun, Feb 19, 2012 : 1:53 a.m.